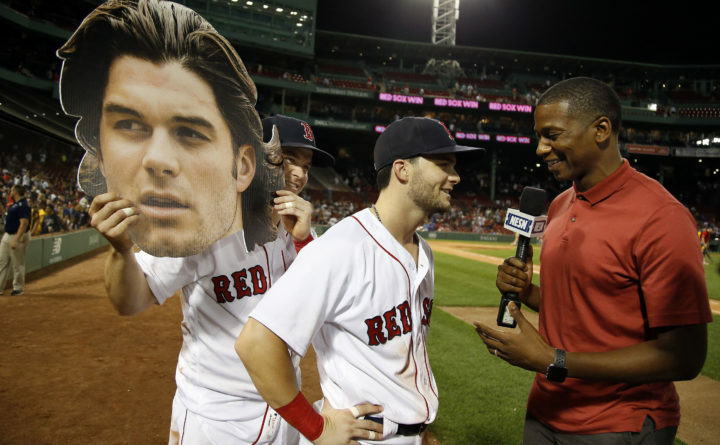 Boston Red Sox's Brock Holt holds up a picture of Andrew Benintendi as he is being interviewed by NESN's Jahmai Webster after their 8-4 win over the Texas Rangers in a baseball game Tuesday, July 10, 2018, in Boston. NEWS CENTER Maine (WCSH 6 in Portland and WLBZ 2 in Bangor) on Thursday began a TV partnership with the New England Sports Network that will involve content sharing of NESN’s Boston Red Sox and Boston Bruins coverage. There will be regularly scheduled live pregame reports from NESN to NEWS CENTER before Red Sox and Bruins games that are being televised by NESN involving NESN’s broadcasters and in-studio analysts. NEWS CENTER’s meteorologists will provide Maine weather updates on NESN before and after games, which will be shown to viewers in northern New England. NEWS CENTER sports director and anchor Jessica Gagne will travel to Boston once a month to supply additional coverage of Red Sox and Bruins games according to Brian Cliffe, NEWS CENTER president and general manager. “Boston’s professional sports teams are what Mainers really focus on in big numbers,” Cliffe said. “It was a confluence of mutual interest. We have the ability to cover the entire state through WCSH and WLBZ. He declined to discuss the financial terms of the agreement. The 31-year-old Gagne has been with NEWS CENTER since 2013 and is looking forward to her role in the arrangement. Gagne, who became the sports anchor at WLBZ in Bangor in 2013, has covered two New England Patriots Super Bowls and the Red Sox in the World Series, said she is looking forward to working with Maine natives Tom Caron (Lewiston) and Dale Arnold (Brunswick). Caron is NESN’s Red Sox studio host and Arnold has a similar role on Bruins telecasts. Gagne has followed their careers and has looked up to them and said it’s nice having them as resources and people she can seek advice from. “It’s so cool. We have a Maine connection,” said Gagne, who became the first woman to win the Maine Sportscaster of the Year Award this year. In addition to her sports duties at NEWS CENTER, she is also a weekend news anchor. Cliffe said its possible Gagne could get some air time on NESN and that would give her and NEWS CENTER some valuable exposure in New England.